Mia Murdock, Grand Prize Middle School Writer. Anthony "Capo" Brewer, Young Artist Grand Prize Winner. 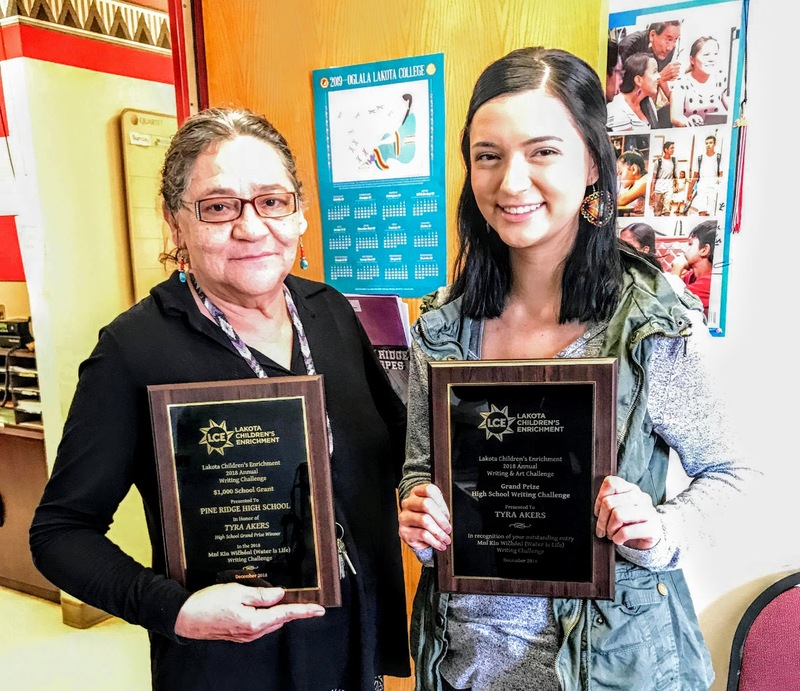 LCE Director and Acting Executive Director Janet Whiting recently delivered plaques and checks to the some of the winners in LCE’s Writing and Art Challenge on the Pine Ridge Reservation. The delivery was delayed, in part, due to storms, harsh weather, school closings and flooding. But, were there’s a will there’s a way! Prizes were mailed to winners who could not be present to accept their awards. The Grand Prize winners in the High School Writing Challenge and the Experienced Art Challenge each received $350 and a plaque. 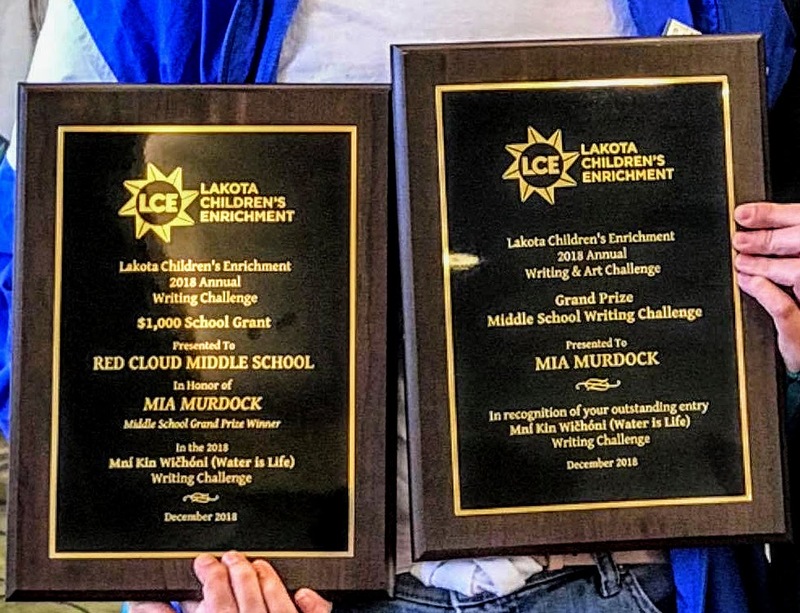 The Grand Prize winners in the Middle School Writing Challenge and the Young Artist Challenge each won $250 and a plaque. The Grand Prize High School and Middle School writers also earned their respective schools (Pine Ridge High School and Red Cloud Middle School) $1,000 in unrestricted grants, along with a plaque to commemorate the accomplishments of the students and their schools. Please take the time to look over the incredible work of these young people! Links to the winning entries of LCE’s prior writing and art challenges may be found on our website. Do you enjoy reading the inspirational words of Native Youth Voices and seeing incredible artwork? Please consider making a donation to keep our work going! Lakota Children’s Enrichment (LCE) is proud to announce that Keith Martinez (Oglala Lakota) has accepted a position as LCE’s new Director of Development. In addition, Keith will serve on LCE’s Board of Directors. Keith is an enrolled member of the Oglala Lakota Sioux of the Pine Ridge Indian Reservation. 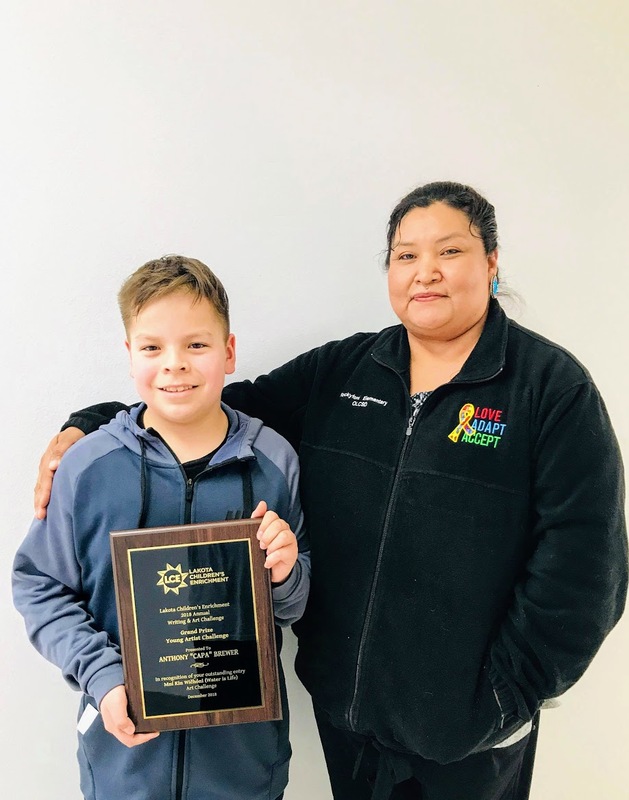 As a college student, Keith Martinez Co-Founded and Chaired LCE’s Youth Advisory Board and was an active participant in its leadership programs on the Pine Ridge Indian Reservation. Keith was named a South Dakota Youth Ambassador for Youth Service America in 2014. 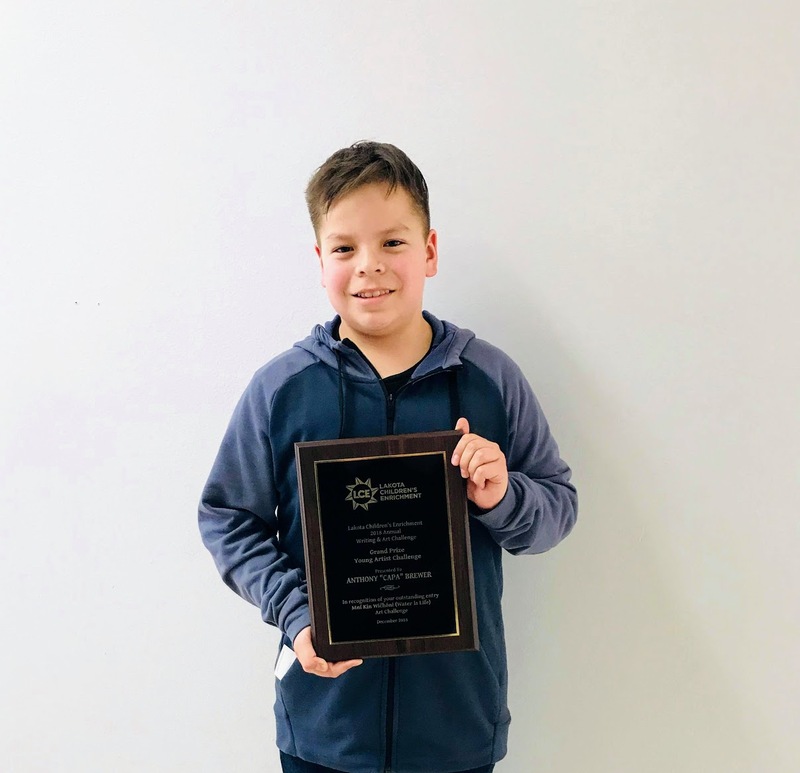 Through this ambassadorship, Keith raised awareness about LCE’s efforts and positively impacted hundreds of young people through his role in helping lead youth summits, fundraising events, toy drives, and LCE’s Writing and Art Challenge. Also in 2014, Keith was one of 5 nationwide recipients of the Center For Native American Youth’s CNAY Champion For Change. Keith graduated in 2016 from Villanova University with a Bachelor Degree in Communications. At Villanova he was a Gates Millennium scholar, Presidential scholar and a Harry S. Truman Scholarship recipient. 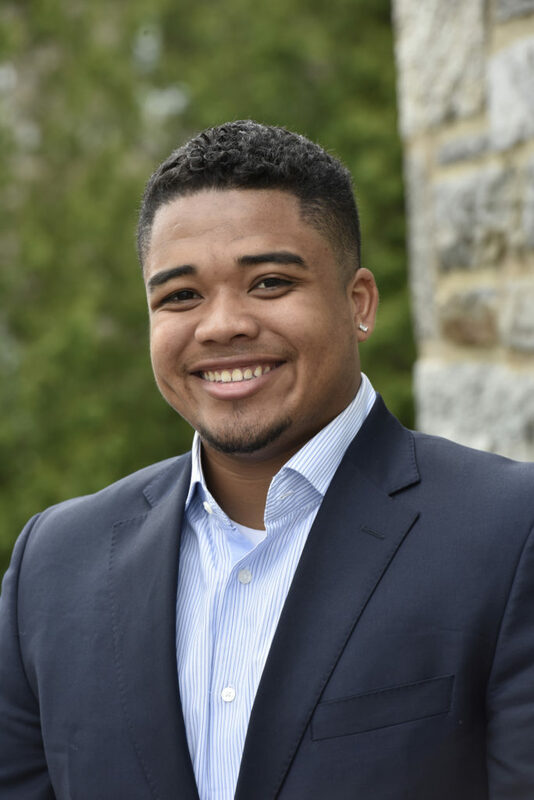 Keith is an alumnus of the 2015 Woodrow Wilson School of Public Policy and International Affairs Junior Summer Institute (PPIA) at Princeton University. Keith will work part-time for LCE from the Washington DC Metropolitan area and will focus his efforts on fundraising and outreach. Speaker, Wiyaka performed an original spoken-word poem! This October 14, 2017, LCE had the pleasure of being a lead sponsor for the 2nd Annual TEDxYouth@DinosaurPark event in Rapid City, South Dakota. Native and Non-Native communities of South Dakota came together in a collaborative educational environment to see 6 diverse speakers share their ideas at the Journey Museum and Learning Center on the theme, Voices of the Land. It was a HUGE success! We have assembled (in alphabetical order) the videos and the bios of each speaker below! Check it out and please share! Liliana Tamayo: Indigenous Rising Liliana is Sicangu Lakota, raised on the Rosebud Reservation. She currently a Junior in college in Omaha, NE and a mentor to Native students who attend Omaha Public Schools. 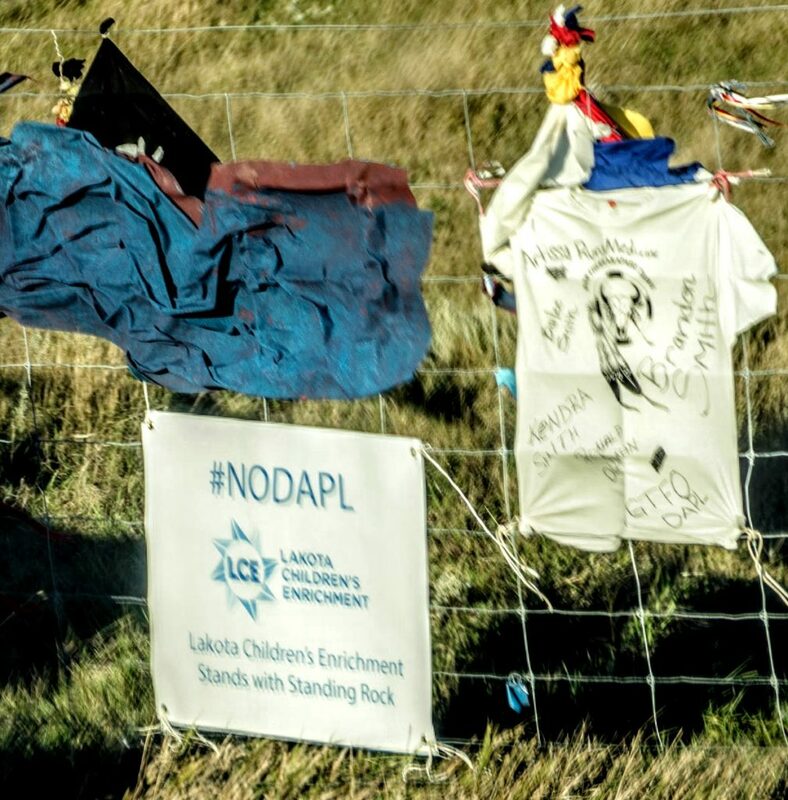 In her talk, Liliana shares her experiences with the movement at Standing Rock against the Dakota Access Pipeline, and explains the importance of today’s Indigenous Rising movements. Marissa Lee Snider “More than 0.01%” Marisa is Lakota from the Hunkpapa, Oglala, and Sicangu bands. She is a recent college graduate who majored in computer science. She is a software developer and is dedicated towards giving back to her community through the access and use of technology. In her talk, Marisa shares that the stark statistic that Native American women make up only 0.01% of technologists, and walks us through the solution of increasing access in Native communities. Nayana Rathmalgoda AKA Lobo Reincarnated “How to Save the Rhino” Nayana is a Critically Acclaimed Artist, entirely self-taught. Joined onstage with his K9, Angel, he is highly passionate about wildlife with a focus on the illegal wildlife trade. In this talk, Nayana shares his project created through his collaboration with the NGO, Breaking the Brand, to combine art and science in an innovative new approach to combat the trade in Rhino Horn at it’s source. 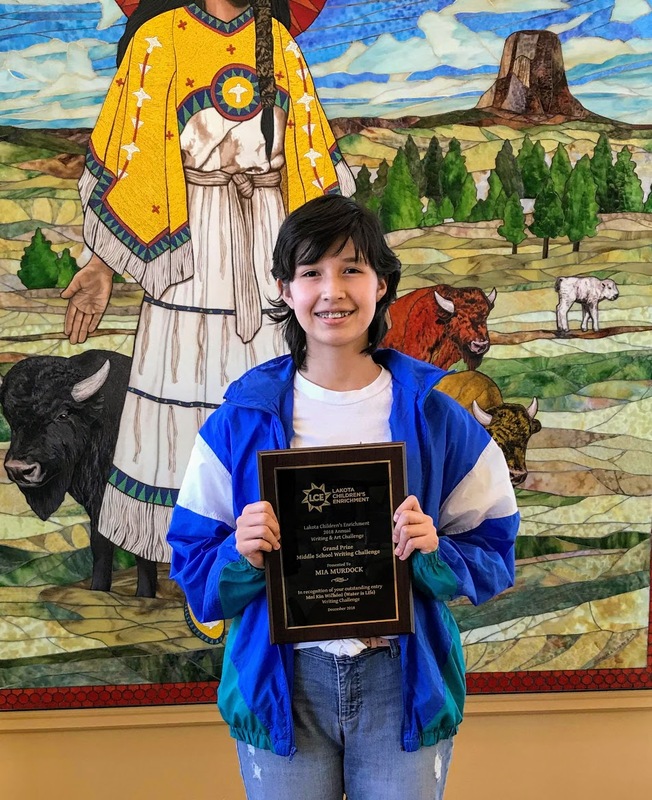 Wiyaka Little Spotted Horse “My Past, Your Future” Wiyaka is a 17-year-old student attending Little Wound High School on the Pine Ridge Indian Reservation in South Dakota. She is a young poet and artist. In her talk, Wiyaka performs her original spoken-word poem, “My past, Your future.” She is member of Lakota Children’s Enrichment’s Youth Advisory Board. Thank you for taking the time to watch these amazing young people share their ideas. We could not produce this event on our own! Thank you to our amazing volunteers and sponsors! Organizers were: Maggie Dunne (Lead Organizer), Autumn White Eyes (Organizer, MC, and Speaker Coach), Cindy Dunne (Organizer and Speaker Coach), Troy Kilpatrick (Organizer and Venue Coordinator), the Journey Museum and Learning Center (event venue), Indigene Entertainment Studios (Photography and Videography), Copy Country (Printing), the Performing Arts Center of Rapid City (lighting), and a huge group of volunteers made up of Lakota youth, LCE’s Youth Board, and community members from the Pine Ridge Reservation! 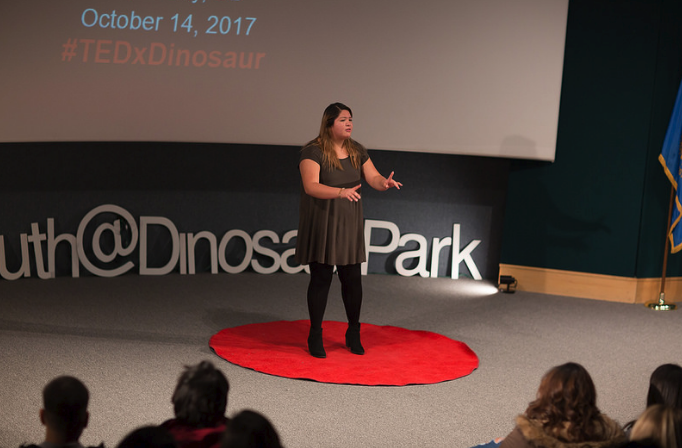 The first TEDxYouth@DinosaurPark took place in April 2016 and was the first TEDxYouth event ever produced in Rapid City, South Dakota. The second event took place on October 14, 2017! TEDxYouth@DinosaurPark, where x = independently organized TED event. The TED conference provides general guidance for the TEDx program, but individual TEDx events, like ours, are self-organized. Learn more about TEDx HERE. 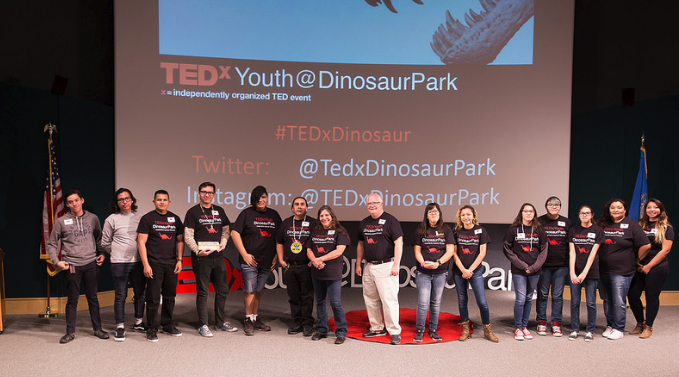 Visit the TEDxYouth@DinosaurPark’s website HERE. Check out all of the photos from our event HERE. 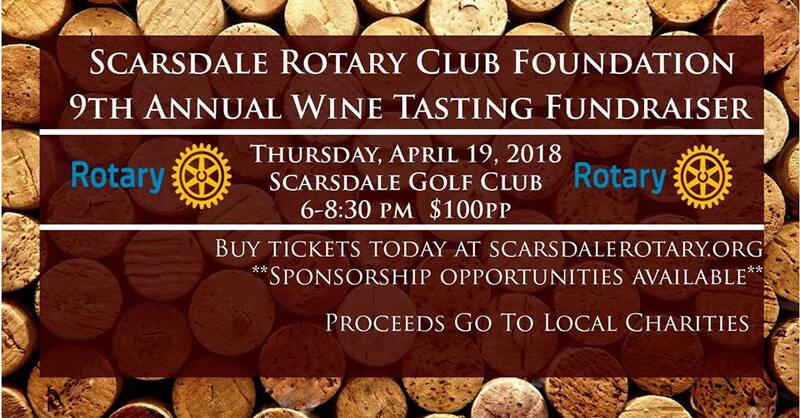 Save the date and buy your ticket today for the Scarsdale Rotary Club annual food and wine tasting fundraiser that will benefit Lakota Children’s Enrichment on April 19, 2018! Email them if you would like to get involved and like them on Facebook!